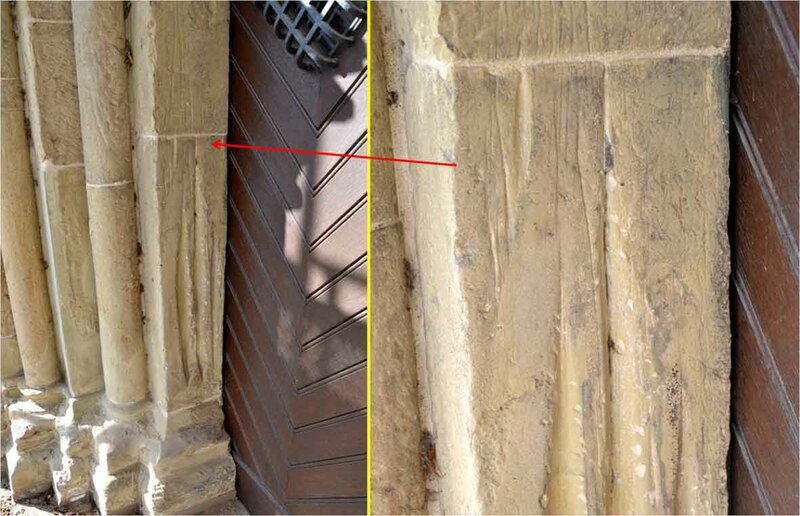 De Belemniet: Scratch marks on churches and other religious buildings - Use as therapeutic stone powder (healing powder)? Use as therapeutic stone powder (healing powder)? Sometimes stones have a special use and application. An example of such a special use is a phenomenon that we know as scratch marks. We can find such scratch marks on the walls of churches and other religious buildings, but also on the walls of town halls and town gates. These scratch marks consist of grooves and spherical hollows. The grooves can be narrow and shallow but they also can look like deep boat-like shapes. The spherical hollows (also called cups or wells) measure from one centimeter until ten centimeter and they can be as deep as seven centimeter. We also found cornerstones of churches that are hollowed out. Historical sources don't learn us very much about the origin of such grooves and cups. The spherical hollows are also called cups or wells. Their seize can be considerably. • Grinding the blades of the weapons (such as swords and spears) of soldiers in the past. • Resting the weapons against the walls of the churches while the soldiers were attending religious services. • Weathering of the stone produced the grooves and cups. • The grooves and cups were created by making 'new' fire at Easter by striking on the outside walls of the churches. • Scratching healing powder to use against diseases such as the plague and typhoid fever and to ward off evil. Most of these theories could easily be rejected and that's what many authors already did soon. The most of them saw the theory about the scratching of the powder to use against diseases, discomforts and to ward off evil as the most plausible. We want to join this theory. The grooves can have deep boat-like shapes. To learn more about the different theories we took a closer look at them. Among other things we did experiments and that made it possible to 'unmask' most of the postulated theories. Only one theory about the scratching of the stone powder remained intact. With this theory as working model we went on with the research of the phenomenon. During this research we personally found the scratch marks on 459 different locations. 162 of these locations are in The Netherlands, 209 in Germany, 68 in Belgium, 7 in Luxemburg, 1 in Denmark and 12 in France. But also in other European countries (such as Great Britain) and even outside Europe they can be found. We found the majority of the scratch marks on the walls of churches and other religious buildings. But we also found them on gravestones, stone crosses, (town) gates and city halls. Scratch marks can be found on different kinds of stone. The appearance of the different scratch marks often depends on the kind of stone. Especially sandstone and soft limestone were (and are) popular to scratch stone powder. Hard carboniferous limestone, basalt and volcanic tuff were not often used. The grooves can also be narrow and shallow. The research gave us more and more indications for the origin of scratch marks: scraping stone powder for the use against diseases, discomforts and to ward off evil. During our search for the scratch marks we found different locations in The Netherlands and Belgium where people still use blessed stone powder and blessed earth: the Sint-Gerlachuskerk in Houthem/Sint Gerlach (NL), the Sint Gerlachuskerk in Banholt (NL), the Sint Catharinakerk in Montfort (NL), the Goddelijke Zaligmakerkerk in Hakendover (B), the Sint Evermaruskapel in Rutten (B) and the Saint Mortkapel in Haillot (B). Read more about these locations in: Blessed earth and stone powder against diseases and other discomforts (part 1). Together with these churches and chapels, where the use of stone powder is still current, a literature study brought us more places where in the recent past people used blessed stone powder and blessed earth for the above mentioned purposes: the Carmelitessenklooster in Vaals (NL), in Heerle (NL), in the Onze Lieve Vrouw Tenhemelopnemingkerk in Prinsenbeek (NL), in Woensdrecht (NL), in the Sint Gertrudiskerk in Vorst (B), in Lembeek (B) and in Meldert (B). Read more in: Blessed earth and stone powder against diseases and other discomforts (part 2). During our research we came into contact with dr. Peter Schels (Kulmbach, Germany). Dr Schels already investigated the scratch marks for a long time. The results of his research as well as many locations of the scratch marks he found are on his website Rillen und Näpfchen. Unfortunately dr. Schels passed away in the Autumn of 2015, soon after we got to know him. At the request of his widow we continued his website together with Rainer Scherb. The name of the website changed and is now called Schabespuren (Scratch marks). Since that time we form together with Rainer the editors of the website. We also are the contact point for new locations with scratch marks. Because of all those new locations and other information about scratch marks we could learn more about the origin of scratch marks and use of the stone powder. Very interesting in this case is what mr. E. Brohl (Germany) told us over the Kilianskirche in Bietigheim-Bissingen (state Baden-Württemberg in Germany). He wrote us about the scratch marks on the wall of this church. The sacristan of the church told him they originated from the use of scratching the powder to bless the sheep. The people threw the powder over these sheep when they were led in procession around the church. Sometimes narrow and shallow grooves end in deep boat-like shapes. Another example of the scratching of stone powder from the wall of a church comes from Roth by Prüm (state Rheinland-Pfalz in Germany). There the worshipers had each year on the 6th of November, on the Name day of Saint Leonard, a pilgrimage. Leonard is a saint of the farmers and their cattle. They also ask him for help when something is wrong with their horses and to protect their stables. Each year with every pilgrimage the grooves in the walls of the church deepened. At a certain moment the sandstone blocks of the wall even had to be replaced! Even nowadays new scratch marks come in to existence. We discovered on many places new (fresh scraped) deep and boat-like grooves and cups. This shouldn't wonder us because stone powder is still in use as a remedy against diseases and other discomforts. We also found (corner)stones of churches that are hollowed out. Nowadays more and more people are interested in the phenomenon of scratch marks. Not only the German website Schabespuren collects locations and information. Also in the Grand Duchy of Luxembourg people are doing research. One of our contacts in that country informed us about the existence of a working group that is researching the phenomenon in the 'Gesellschaft für Vorgeschichte (Société préhistorique luxembourgeoise). in Great-Britain we could introduce the phenomenon further with an article that we published together with Dr. Christopher Duffin of the Natural History Museum in London in the 'Parmaceutical Historian' (number 44, June 2014; British Society for the History of Pharmacy: Possible sources of therapeutic stone powder from North West Europe). The complete text of the article can be downloaded via the links Researchgate or Academia. 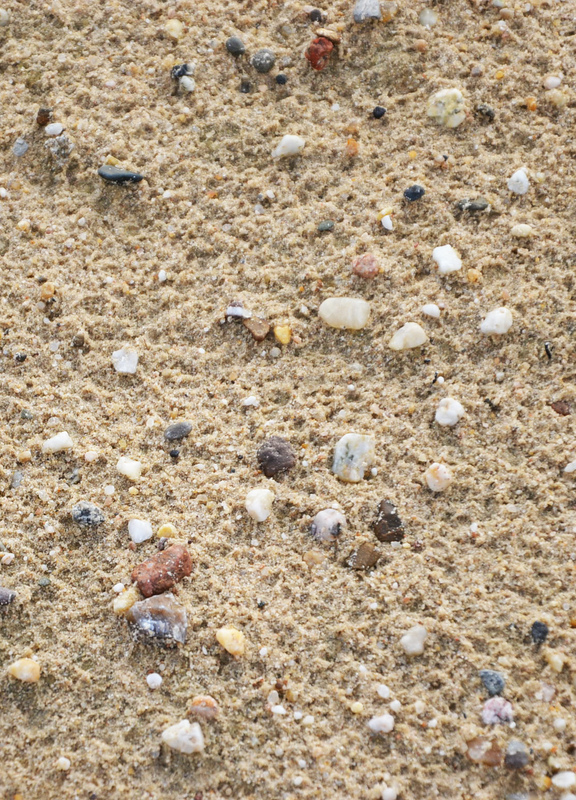 Blessed sand in the Sint Gerlachuskapel in Houthem/Sint Gerlach in The Netherlands. Visitors can take a little bit of it. Pictures of the scratch marks (with additional information) we found in The Netherlands and elsewhere can be seen on the German website Schabespuren.